A few years ago, my friend Robert Wright asked me to help him fine tune something he was working on. Robert is a sales and marketing consultant and a really smart guy, and the stuff he was working on was organizing a series what he called buyer personas. These were essentially descriptors or profiles of various types of buyers in the professional world. Purchasing people and other buying decision makers across the business spectrum. The core information that guided the creation of these profiles came from two different sources, both psychologists who dealt with various aspects of human behaviour regarding buying and selling. The profiles were designed to essentially be made available to high-end professional salespeople to help them figure out the types of buyers they were dealing with in order to find some common ground and relatable language through which they could make effective connections. I spent the better part of a month ploughing through Robert’s research to structure these personas into a presentable format that would be easy for just about anyone to absorb. And it was during this process and my protracted conversations with Robert that I discovered the Magic Formula For Just About Everything. I was fascinated by the way that Robert had broken these personas down into about 12 different categories, each with three or four different subsets. The insights that he applied to these personas were astonishing and taught me a lot of things about human nature that I never really knew before, or at least had never thought much about. After I had finished developing the personas and was writing the sales presentation that would go out with a couple of sample personas, I asked Robert how he arrived at this idea in the first place. He told me that the personas were really just tool, or a means to the end of the sales process. When I asked him what the ‘end’ was, he told me the end wasn’t a sale. The end was achieving a state of ‘like and trust’ between the seller and the buyer. The seller uses the personas to get an impression of the kind of person he is dealing with, and an idea of how to create a meaningful conversation that can lead to a good relationship. After that, the sale is really, according to Robert, assured. If you think back to the best working relationships you have ever had you will invariably conclude that they were good relationships because the like and trust factors were high. You felt comfortable working with the person or persons you were working with and had confidence in them. And the reverse was also true, so your relationship was effortless. Something close to genuine friendship. In the advertising business, I was lucky to have had a long succession of people I liked and trusted to work with, and many of them did become good friends and we are still good friends today. That’s how it works in the professional world. You become friends with a lot of the people you work with, because the work is demanding and most of the time you really don’t have the inclination or time to look for and develop friendships outside that world. If you think about it, you will find that a lot of the choices you make in life are based on the same ‘like and trust’ formula. 1. I have a Metro supermarket near me, and when we moved here I started going in to buy my meat. I ended up getting to know both the meat department manager and the store’s owner as well, and they struck me as really good people who genuinely enjoyed the business they were in. So I liked them because they seemed like good guys and I trusted them because they very much seemed to like their work, which invariably led me to feel comfortable shopping there. And, of course, the meat was always very tasty. A lot of times these like and trust decisions are instinctual. Many of the women in my life pretty much make every important decision based on like and trust. They just have a feel for people and they are right way more often than they are wrong. And a lot of that has (thankfully) rubbed off on me. 2. We have done a ton of renovation on our house since we moved to St. Catharines and a lot of the decisions we made about who to hire came from our gut feeling about ‘like and trust’ or as recommendations from people we already ‘liked and trusted. 3. I have written about 35 social media columns with a guy in Florida named Phil Friedman. These are all pieces I am quite proud of, as I am sure Phil is and they always get a lot of attention when we post them. But honestly, the reason that they work is that we like and trust each other to a very high degree. We respect each other’s writing skill and opinions and we publish our post almost completely as we wrote them. That requires many tons of like and trust. It’s true. All you have to do is think about it. The best jobs you’ve ever had…the clients you have done your best work for…the best referrals you have received and the ones you give all have something very much to do with the like and trust formula. Your path through life can be smooth or rocky or, more likely, a combination of both. But when it comes to the smooth side you will see that finding people you like and trust and working to make sure that you are liked and trusted by them is always going to lead to something good. 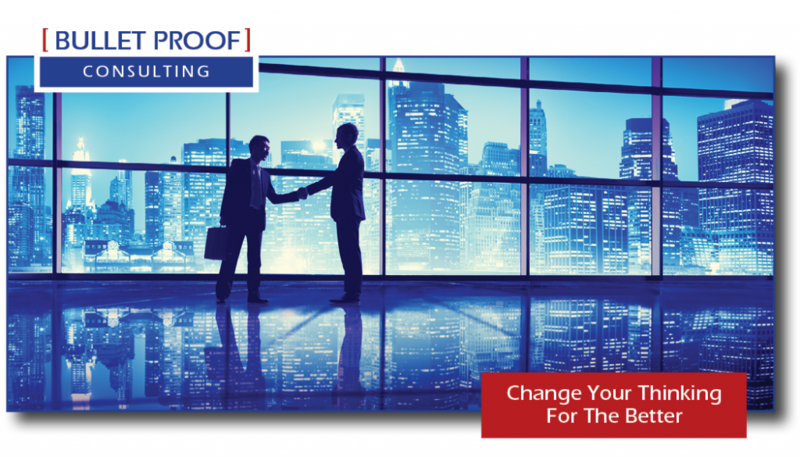 Our partnership in Bullet Proof Consulting is based almost exclusively on like and trust, as are our relationships with the clients we have attracted. It’s not something you need to be hyper-conscious of. Because mainly, it’s either in your DNA or it’s not. And it really comes down to simple things like treating people the way you would prefer to be treated yourself. So I guess that the Magic Formula To Just About Everything is really nothing more than a souped-up version of the classic Golden Rule. Yeah, I like that…and wouldn’t you know it, I trust it too. If you’d like to learn more, give me a call.